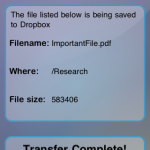 Save Files Straight into Dropbox! Have you ever thought to yourself, "I wish I had a Save-As button!". Imagine being able to receive an email and immediately save that attachment straight into Dropbox. Or imagine the ability to download a ZIP file using Mobile Safari, and saving it directly to Dropbox, where you can access it from all of your PCs. Dropbox is an incredible tool that allows all of your PCs to access the same set of files and keep them in sync. 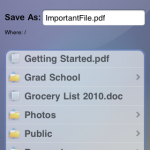 Your iPhone can finally join the party, using SaveToDropbox. This app is designed to be as simple as possible, with the goal of allowing you to save data from your iPhone apps into Dropbox with as few taps as possible. 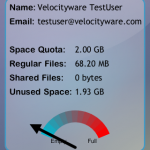 Its easy to free all of your data from your iPhone. 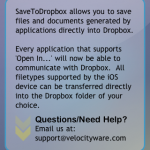 SaveToDropbox will allow any iPhone application that supports the "Open In.." capability to immediately take advantage of Dropbox. Once you pick "Open In..." just select the new "Save To Dropbox" option. With just one more tap, your data will be in the Dropbox cloud! Within seconds that data once stuck in your iPhone will now be available to your Window or Mac PCs or even the web via the Dropbox web interface. You will have more flexibility in your work flow. Did you just receive a Microsoft Access document on your iPhone, but you don't have Microsoft Access? That's ok, just use SaveToDropbox to save it into the cloud, and open it from your PC when you get a chance. Available into any app that supports "Open in..."